Scripting languages such as Python are ideally suited to common programming tasks in cheminformatics such as data analysis and parsing information from files. However, for reasons of efficiency, cheminformatics toolkits such as the OpenBabel toolkit are often implemented in compiled languages such as C++. We describe Pybel, a Python module that provides access to the OpenBabel toolkit. Pybel wraps the direct toolkit bindings to simplify common tasks such as reading and writing molecular files and calculating fingerprints. Extensive use is made of Python iterators to simplify loops such as that over all the molecules in a file. A Pybel Molecule can be easily interconverted to an OpenBabel OBMol to access those methods or attributes not wrapped by Pybel. Pybel allows cheminformaticians to rapidly develop Python scripts that manipulate chemical information. It is open source, available cross-platform, and offers the power of the OpenBabel toolkit to Python programmers. Cheminformaticians often need to write once-off scripts to create extract data from text files, prepare data for analysis or carry out simple statistics. Scripting languages such as Perl, Python and Ruby are ideally suited to these day-to-day tasks . Such languages are, however, an order of magnitude or more slower than compiled languages such as C++. Since cheminformaticians regularly deal with molecular files containing thousands of molecules and many cheminformatics algorithms are computationally expensive, cheminformatics toolkits are typically written in compiled languages for performance. OpenBabel is a C++ toolkit with extensive capabilities for reading and writing molecular file formats (over 80 are supported) as well as for manipulating molecular data . Many standard chemistry algorithms are included, for example, determination of the smallest set of smallest rings, bond order perception, addition of hydrogens, and assignment of Gasteiger charges. In relation to cheminformatics, OpenBabel supports SMARTS searching , molecular fingerprints  (both Daylight-type, and structural-key based), and includes group contribution descriptors for LogP , polar surface area (PSA)  and molar refractivity (MR) . Of the current popular scripting languages, Python  is the de-facto standard language for scripting in cheminformatics. Several commercial cheminformatics toolkits have interfaces in Python: OpenEye's closed-source successor to OpenBabel, OEChem , is a C++ toolkit with interfaces in Python and Java; Rational Discovery's RDKit , which is now open source, is a C++ cheminformatics toolkit with a Python interface; the Daylight toolkit  from Daylight Chemical Information Systems, written in C, only has Java and C++ wrappers but PyDaylight , available separately from Dalke Scientific, provides a Python interface to the toolkit; the Cambios Molecular Toolkit  from Cambios Consulting is a commercial C++ toolkit with a Python interface. There are also toolkits entirely implemented in Python: Frowns , an open source cheminformatics toolkit by Brian Kelley, and PyBabel , an open source toolkit included in the MGLTools package from the Molecular Graphics Labs at the Scripps Research Institute. Note that the latter is not related to the OpenBabel project; rather its name derives from the fact that its aim was to implement in Python some of the functionality of Babel v1.6 , a command-line application for converting file formats which is a predecessor of OpenBabel. Here we describe the implementation and application of Pybel, a Python module that provides access to the OpenBabel C++ library from the Python programming language. Pybel builds on the basic Python bindings to make it easier to carry out frequent tasks in cheminformatics. It also aims to be as 'Pythonic' as possible; that is, to adhere to Python language conventions and idioms, and where possible to make use of Python language features such as iterators. The result is a module that takes advantage of Python's expressive syntax to allow cheminformaticians to carry out tasks such as SMARTS matching, data field manipulation and calculation of molecular fingerprints in just a few lines of code. 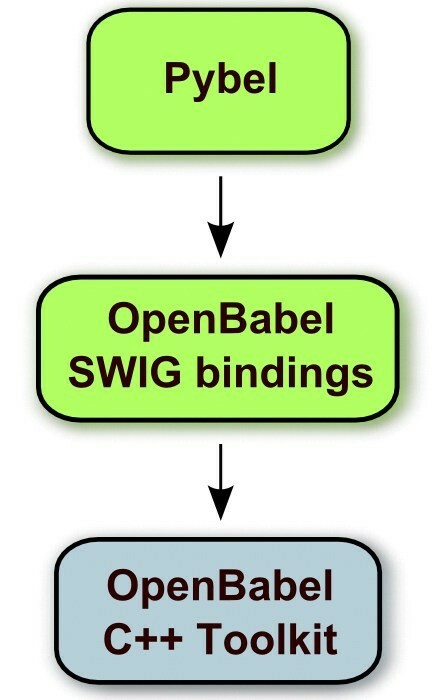 Python bindings to the OpenBabel toolkit were created using SWIG . SWIG (Simplified Wrapper and Interface Generator) is a tool that automates the generation of bindings to libraries written in C or C++. One of the advantages of SWIG compared to other automated wrapping methods such as Boost.Python  or SIP  is that SWIG also supports the generation of bindings to several other languages. For example, OpenBabel also uses SWIG to generate bindings for Perl, Ruby and Java. An additional advantage is that SWIG will directly parse C or C++ header files while Boost.Python and SIP require each C++ class to be exposed manually. The input to SWIG is an interface file containing a list of OpenBabel header files for which to generate bindings. Using the signatures in the header files, SWIG generates a C file which, when compiled and linked with the Python development libraries and OpenBabel, creates a Python extension module, openbabel. This can then be imported into a Python script like any other Python module using the "import openbabel" statement. For a small number of C++ objects and functions, it was necessary to add some convenience functions to facilitate access from Python. Certain types of molecule files have additional data present in addition to the connection table. OpenBabel stores these data in subclasses of OBGenericData such as OBPairData (for the data fields in molecule files such as MOL files and SDF files) and OBUnitCell (for the data fields in CIF files). To access the data it is necessary to 'downcast' an instance of OBGenericData to the specific subclass. For this reason, two convenience functions were added to the interface file, one to cast OBGenericData to OBPairData, and one to cast to OBUnitCell. Another convenience function was added to convert a Python list to a C array of doubles, as this type of input is required for a small number of OpenBabel functions. Iterators are an important feature of the OpenBabel C++ library. For example, OBAtomAtomIter allows the user to easily iterate over the atoms attached to a particular atom, and OBResidueIter is an iterator over the residues in a molecule. The OpenBabel iterators use the dereference operator to access the data, the increment operator to iterate to the next element, and the boolean operator to test whether any elements remain. Iterators are also a core feature of the Python language. However, the iterators used by OpenBabel are not automatically converted into Python iterators. To deal with this, Python iterator classes that wrap the dereference, increment and boolean operators behind the scenes were added to the SWIG interface file, so that Python statements such as "for attached_obatom in OBAtomAtomIter(obatom)" work without problem. The SWIG bindings provide direct access from Python to the C++ objects and functions in the OpenBabel API (application programming interface). The purpose of the Pybel module is to wrap these bindings to present a more Pythonic interface to OpenBabel (Figure 1). This extra level of abstraction is useful as Python programmers expect Python libraries to behave in certain ways that a C++ library does not. For example, in Python, attributes of an object are often directly accessed whereas in C++ it is typical to call Get/Set functions to access them. A C++ function returning a particular object might require a pointer to an empty object as a parameter, whereas the Python equivalent would not. Even something as simple as differences in the conventions for the case of letters used in variable and method names is a problem, as it makes it more likely for Python programmers to introduce bugs in their code. The relationship between Python modules described in the text and the OpenBabel C++ library. Python modules are shown in green; the C++ library is shown in blue. Pybel provides replacements for two of the main classes in the OpenBabel library, OBMol and OBAtom. The following discussion describes the Pybel Molecule class which wraps an instance of OBMol, but the same design principles apply to the Pybel Atom class. Table 1 summarises the attributes and methods of the Molecule object. By wrapping the base class, Pybel can enhance the Molecule object by providing (1) direct access to attributes rather than through the use of Get methods, (2) additional attributes of the object, and (3) additional methods that act on the object. *Where a Molecule attribute is a direct replacement for a 'Get' method of the underlying OBMol, the name of the method is given in parentheses. As mentioned earlier, it is typical in Python to access attribute values directly rather than using Get/Set methods. With this in mind, the Molecule class adds attributes such as energy, formula and molwt (among others) which give the values returned by calling GetEnergy(), GetFormula() and GetMolWt(), respectively on the underlying OBMol (see Table 1 for the full list). It should be noted that all of these attributes are calculated on-the-fly rather than stored for future access as the underlying OBMol may have been modified. Four additional methods have been added to the Pybel Molecule (Table 1). The first is a write method which writes a representation of the Molecule to a file and takes care of error handling. As with reading molecules from files (see above), this method simplifies the procedure significantly compared to using the SWIG bindings directly. In addition, a calcfp method and a calcdesc method have been added which calculate a binary fingerprint for the molecule, and some descriptor values, respectively. In the OpenBabel library these are not methods of the OBMol, but rather are loaded as plugins (by OBFingerprint.FindFingerprint and OBDescriptor.FindType, respectively) to which an OBMol is passed as input. The __iter__ method is a special Python method that enables iteration over an object; in the case of a Molecule, the defined iterator loops over the Atoms of the Molecule. This feature enables constructions such as "for atom in mol" where mol is a Pybel Molecule. To minimise programming errors, programs written dynamically-typed languages such as Python should be tested comprehensively. Pybel has 100% code coverage in terms of unit tests, as measured by Ned Batchelder's coverage.py . It also has several doctests, short snippets of Python code included in documentation strings which serve as both examples of usage and as unit tests. The Pybel API is fully documented with docstrings. These can be accessed in the usual way with the help() command at the interactive Python prompt after importing Pybel: for example, "help(pybel.Molecule)". In addition, the OpenBabel Python web page  contains a complete description of how to use the SWIG bindings and the Pybel API. The webpage also contains links to HTML versions of the OpenBabel API documentation and Pybel API documentation. The latter is included in Additional File 1. The principle aim of Pybel is to make it simpler to use the OpenBabel toolkit to carry out common tasks in cheminformatics. These common tasks include reading and writing molecule files, accessing data fields of a molecule, computing and comparing molecular fingerprints and SMARTS matching. Here we present some examples that illustrate how Pybel may be used to carry out common cheminformatics tasks. """Return the values of the Lipinski descriptors.""" The future development of Pybel is closely linked to any changes and improvements to OpenBabel. With each new release of the OpenBabel API, the SWIG bindings will be updated to include any additional functionality. However, additions to the Pybel API will only occur if they simplify access to new features of the OpenBabel toolkit of general use to cheminformaticians. In general, the Pybel API can be considered stable, and an effort will be made to ensure that future changes will be backwards compatible. Pybel provides a high-level Python interface to the widely-used OpenBabel C++ toolkit. This combination of a high performance cheminformatics toolkit and an expressive scripting language makes it easy for cheminformaticians to rapidly and efficiently write scripts to manipulate molecular data. Pybel is freely available from the OpenBabel web site2 both as part of the OpenBabel source distribution and for Windows as an executable installer. Compiled versions are also available as packages in some Linux distributions (openbabel-python in Fedora, for example). The idea for the Pybel module was inspired by Andrew Dalke's work on PyDaylight . We thank the anonymous reviewers for their helpful comments. GRH is the lead developer of OpenBabel and created the SWIG bindings. NMOB developed Pybel, and extended the SWIG interface file. CM compiled the SWIG bindings on Windows and added convenience functions to the OpenBabel API to facilitate access from scripting languages. All authors read and approved the final manuscript.